I think, to a large extent, the internet is killing print media. It's just so fast, and so on top of things. Sometimes, it takes my breath away just seeing how much faster even trends come and go! Not to mention micro-trends... no print media can keep up. It's not just magazines, its newspapers, too. It's a shame because I do think that there are a lot of people, myself included, who use the internet every day, but just prefer holding something. 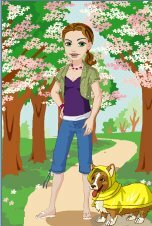 Some people can read entire books and magazines on the internet, but I can't, and honestly, I don't want to. It's too bad, because it's much better for the environment, and for the publications (since advertising can't sustain them anymore...). I would hate to give up morning coffee and the New York Times. That said... I can't afford a $5 paper every Sunday either, to cover their costs. The thing newspapers and magazines have to do is have better reporting or somehow niche - more in-depth, somehow broader or more educational somehow. It's a shame about Cottage Living because, like Blueprint, I felt that it actually had things a mere mortal like myself could afford to buy or make. I look at magazines like Architectual Digest and Dwell and think, there is no way I can afford that (if I'd even want to). There really is no print media for the kind of beautiful, affordable, yet artistic and well-made pieces and interiors that I have seen on the blogs. I love Domino, but it's like candy. Most people I know don't buy $200/yard fabric to reupholster a brand new DWR couch. But on the internet, (and one thing I especially like about this blog) you can see real people doing real things that are still beautiful and inspirational. That's why the internet is killing the media, with positive things as well as negative. What a bummer about Cottage Living. It was one of my favorites, but so was Blueprint. I think the internet is killing these print mags. But, I wonder that some have not taken up a blogging format that still features somewhat lengthy articles along with daily tidbits from multiple staff contributors. Not the same as holding the shiny, pretty pages in your hands, I know. I have a sickness with keeping all of my magazines, so I will miss Cottage Living. Btw, I gave up my print NY Times subscription this year and have not really missed it. I subscribe to the online Times Reader (only for PCs at the moment but here's hoping for Mac version soon) and its actually terrific. I just posted on this today too! I was just thinking this morning about whether or not I wanted to renew any magazines, and honestly, blogs did factor into my thinking. The blogs I read (and this one is a favorite!) fulfill a similar desire, and don't take up paper. The electricity I use will be used anyway -- my computer's likely on already for other reasons. On the other hand, bloggers like you get some of your content from magazine stories or pictures worth writing about, and I wouldn't want to lose that content, either. I agree with all the comments--now I look forward to the daily blog postings the same way I used to look forward to seeing a new magazine issue. It does place a heavier burden on the bloggers, as I do think it will now require a lot more detective work to generate original material. Hopefully designers and others will realize the potential of blogs and get the material to you when they have it. If I were a well-known blogger I would begin building a database of advertisers right now from the defunct magazines--because when things get better--and they will--they are going to be looking for places to advertise. 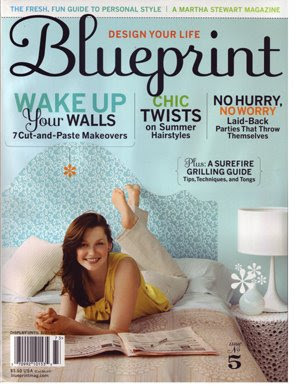 betty - don't forget that blueprint did have a go at running a blog after the magazine closed, but then they shut down suddenly and with little explanation. Argh, I subscribed to 4 of those (5 if you count Domino) -- how traumatic to see them all together! Some of my favorites, too. I'm not convinced it's the blogs that are killing magazines, though. To me, the two are apples and oranges. As much as I'm addicted to blogs, I'll always have a place for magazines in the same way I'll always have a place for books -- deeper content, thought out over more time and edited by pros, plus of course the tactile experience of propping it on your lap and turning the pages.... I suspect their demise is related to whatever makes ALL industries consolidate into fewer and fewer choices these days. i totally agree with the sentiment that online media is shutting down printed media. not only with decorating/design magazines, but every other genre as well. newspapers and magazines are already out of date by the time they're printed. i'll definitely miss having those kinds of reads though...something about sharing a newspaper on a lazy morning, or re-reading favorite articles on a quiet evening. Say it ain't so! Cottage Living is my very favorite of all shelter mags. I'm so going to miss a fresh issue arriving in my mailbox each month. I'm sad. I'm sad that so many shelter magazines are closing up shop, because I don't read fashion magazines at all. 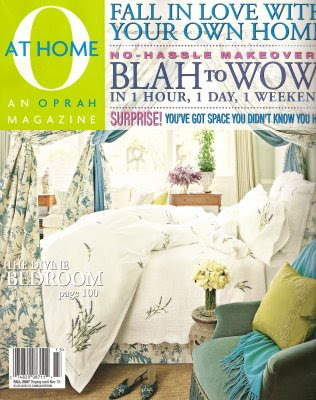 My subscription to Home was replaced with Elle Decor, but that subscription is just about up anyway. I guess I will have no choice but to get my fix from blogs now. Hmmm. While I'm addicted on a daily basis to design blogs such as yours, I also really love the experience of getting a new mag in the mail or from the store, curling up and doing some serious perusing and studying. And, tear sheets! 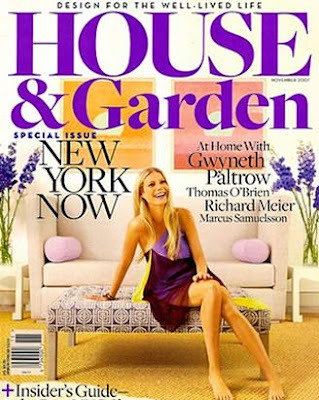 Also, with the higher-end mags, such as Home & Garden -- I found those very inspiring & educational too, to see what the very rich could afford to try out in design. I HOPE Domino doesn't fold. I do think it needs to expand beyond the first-apartment, twenty-something vibe though. Us homeowners in the suburbs have needs, too! I'm extremely sad about Cottage Living. 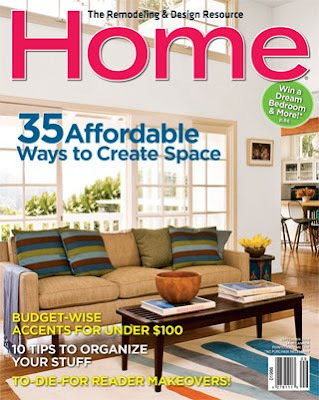 It is one of my top 2 favorite home design magazines. Domino being the other one. I feel completely forlorn without them. Meanwhile, I posted about this the other day too and agree with you about bloggers. I love blogging, but it's just not the same as a magazine. I can take the magazine with me on a plane, sit in my chair and leaf through it. I tear out pages and keep them in my file. Most of my best inspiration images have come from magazines, not from online. One of my favorite things to do is read a decorating magazine. I love going to the bookstore and picking up the mags with the prettiest covers to see what is inside. Blueprint was such a neat publication. I wish it was still around. I love reading design blogs. They seem so real as opposed to mags like Elle Decor that only show homes decorated by interior designers and they all look fake and contrived. 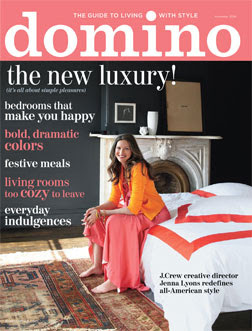 I used to look forward to domino but somehow the magazine has changed a lot. I shall not be renewing my subscription. However, every month i look forward to buying Elle decoration UK and Living etc. It is money well spent. Ditto for Inside out australia and sometimes Vogue Living (aus). I agree, I think the design blogs have a LOT more power than ever expected. For the most part, nobody is paying us to feature them. No big job losses if we see the emperor has no clothes and say so. But I will say this, There's nothing like being able to go back and reference from a saved magazine. Having it in hand for me, is so much better than pulling it up on a screen. hopefully this is just upping the game for the remaining players. I also agree that I think the reason the print media is having trouble is because of the internet. It is a lifestyle change I guess. 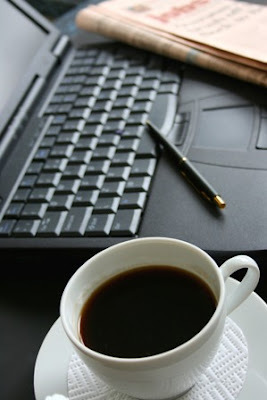 Blogs are better in that they are free, always available, and changing. The thing that I don't like about the internet is that it hurts my eyes to read it after a while. I haven't cancelled any of my subscriptions though. I still like getting something in the mail, flipping through the pages really fast, and having tear sheets. So, have you heard anything about ReadyMade? I keep getting subscription offers from them. 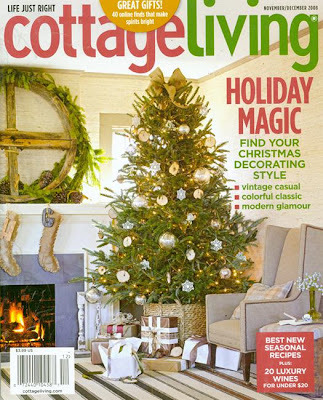 Cottage Living was one of my alltime favorite mags ... so I'm rather sad about this news. I would LOVE it if rather than shutting down CL entirely, Time Inc. could turn it into a web destination, complete with good blogs. Alas, I don't see that happening anytime soon. It's a shame too because I think it would have a fighting chance online. That said, print magazines backed by larger publishing companies did have some advantages I'll miss. Cottage Living, for example, stepped up to help rebuild New Orleans after Katrina, by commissioning new cottage layouts, building idea houses, donating staff time to rebuild, and encouraging donations from readers. I don't see any blogs having the wherewithal to do that type of work anytime soon. It's advertising, I think, it's hitting loads of magazines for years. A good friend of mine was forced into early retirement at Business Week a year or so ago because of a dearth of advertising. It's possible that companies aren't bothering with magazine advertising because they think their wares are being shown online. Still, I'm sad, Cottage Living was my favorite shelter magazine. I've asked for magazine subscriptions for Xmas since they're cheap. Now I'm kinda afraid a giver is going to get stuck dishing out the money only to have it fold and not fulfill it's subscription. I will miss Cottage Living but I'm kinda over Domino. May not renew and then I'll feel even worse if it folds.